I'm somewhat late with my planned Ultimate ADOM update... here we go with bits and pieces. Actually we are getting prepared for Roguelike Celebration 2018 in San Francisco. There we will show a first live demo of Ultimate ADOM: Caverns of Chaos, our upcoming attempt at building the ultimate roguelike dungeon crawler in a world with details never seen before. 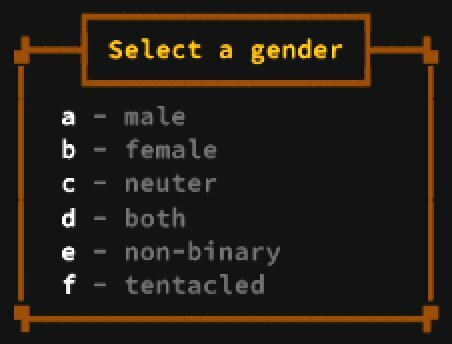 (well, maybe in Dwarven Fortress... in some respects... but we are working on building an easily accessible game with tons of depth and surprises ;-) ). While preparations are underway we decided that we will start seriously speaking about Ultimate ADOM beginning with the presentations at Roguelike Celebration 2018. One part of this is that we currently are preparing a separate new website for Ultimate ADOM that also will contain a blog so that we have a focussed communcation channel for all news regarding Ultimate ADOM. 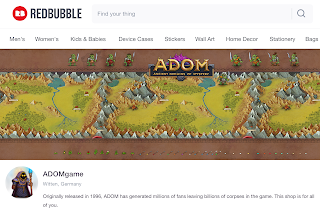 We have spent the past 8+ months building the underlying game engine for Ultimate ADOM (called AGE for ADOM Game Engine) which in turn is using Unity as a technical platform so that we can more easily ship Ultimate ADOM on many platforms. 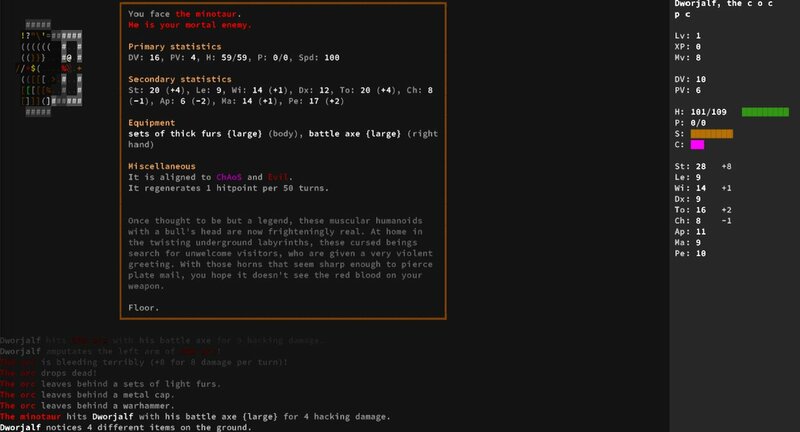 AGE is a platform agnostic game engine controlling the game flow and everything that exists in the worlds of Ultimate ADOM. It's Unity-inpendent (although we have no plans to use something other than Unity) and uses an Entity Component System architecture for modeling everything - with refinements to the basic architectural approach to allow us to be even more flexible and build worlds of incredible depth. The past months have been spent on building many of the basic features needed for a deep game (and there are still quite a few months ahead of us for building more of that). While I now could start talking about our detailed skeleton infrastructure modeling the shape of bodies (and allowing for amuptations and grafting), our breath-taking new magic system (in which I just added spells for animating inanimate objects), our system for possessing/controlling arbitrary monsters, our growing in-game physics simulation allowing more and more complex interactions with the environment (from freezing water over boiling it to steam clouds, push mechanics and more) I'll defer doing so until we start presenting stuff at the beginning of October. Additionally we are heavily working on our graphics and sounds for the game as well as lots of concept art (some of which I already posted). Please follow my Twitter account where I occasionally tease things if you feel you need infos now... everything else will have to wait a little more. Next week we will be finalizing our communcation plans for the weeks and months to come and then we'll see! 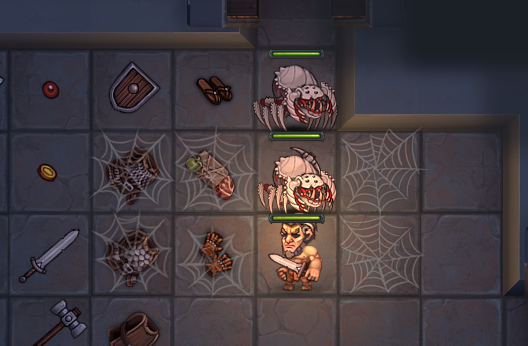 Sorry for having fallen silent for so long - we have been awfully busy working on Ultimate ADOM, especially now that Roguelike Celebration has been moved forward by one month in the calender (6/7th of October in San Francisco - come and join us for a weekend of roguelike fun!). This post only is concerned with an update regarding ADOM - more details about Ultimate ADOM to follow by the end of week (and regular once more from now on). 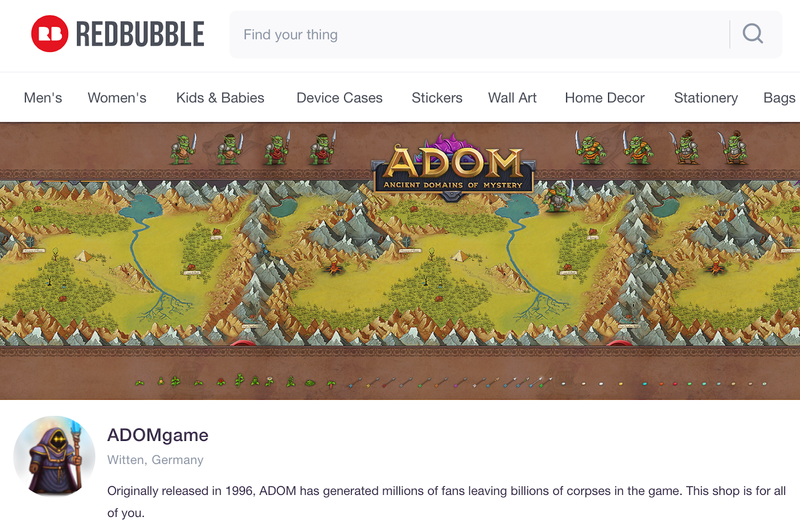 First thing: We have opened up an online merchandising store for ADOM goodies because we had been asked about that quite often in the past 24 months. So here we go. If there are things you would like to see there we don't yet have let us know - either in the comments below or via our ticket system. 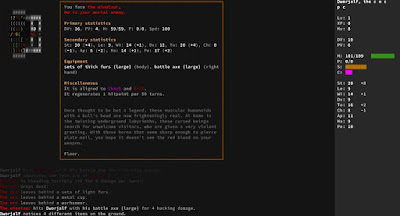 At a later point we also will be adding Ultimate ADOM stuff. We finally port ADOM to GOG (and GOG Galaxy). We are not yet sure when the port if finished but target end of August / September (there are some C++ things in the API that we still need to work out). Then ADOM finally can be puchased DRM free at GOG. Another older ticket will be one of the main features of the next content release - floating status information (damage numbers, special effects like poison, sickness, starvation, etc.). While this might seem rather minor it will be a huge UI improvement as our tests have shown that many people nowadays don't read the status messages at all (and many more just skim them occasionally). Thus important information easily can get lost. Now seeing a message floating up over the head of the PC will alleviate this. This major addition will be combined with many minor bug fixes and game balance adjustments for the next ADOM release (which hopefully will be on Steam by the end of August). That's it for today... stay tuned for tons of Ultimate ADOM updates (working on which takes up about 95% of our time right now).